These esports orgs rule supreme on Facebook, Twitter, Instagram, and YouTube. In esports, winning titles isn’t everything. For the biggest organizations, success isn’t only determined by achievements on the server, but also by growing a loyal fanbase. That’s why many esports clubs attempt to master social media as much as the games they compete in. This includes everything from silly memes to pre-game banter, behind-the-scenes documentaries to all kinds of announcements—including announcements of announcements. Some orgs have gathered incredible numbers of fans on their social media accounts, extending into the millions of followers from all over the world. A large following isn’t telling on its own, of course. The second important variable is the engagement, it’s making sure that those fans are commenting, liking, and sharing. Manipulation is also a thing when it comes to social media followers. Fake fans, including bots that interact with the page they follow, are widespread. Fake followers don’t necessarily mean wrongdoing by the respective org, however. The larger the natural fan base, the more likely it attracts fake followers as well. To get a better understanding of how esports orgs use social media and, more importantly, who is ahead of the pack when it comes to the largest fanbases, we take a look at the top ten esports orgs by followers on Facebook, Twitter, Instagram, and YouTube respectively. With almost 1.9 billion monthly active users, which is nearly twice as much as the second largest social network, namely WhatsApp, Facebook is the undisputed king of social media. For esports orgs, it’s an ocean full of potential followers, which drives huge amounts of engagement. To put things in context: one in five page views in the U.S. occurs on Facebook. When strategizing social media, there’s no way around Facebook, for sure. What esports brands seem to love most about Facebook is its video option. Short frag movies, highlights, or behind-the-scenes clips guarantee engagement and often go viral. 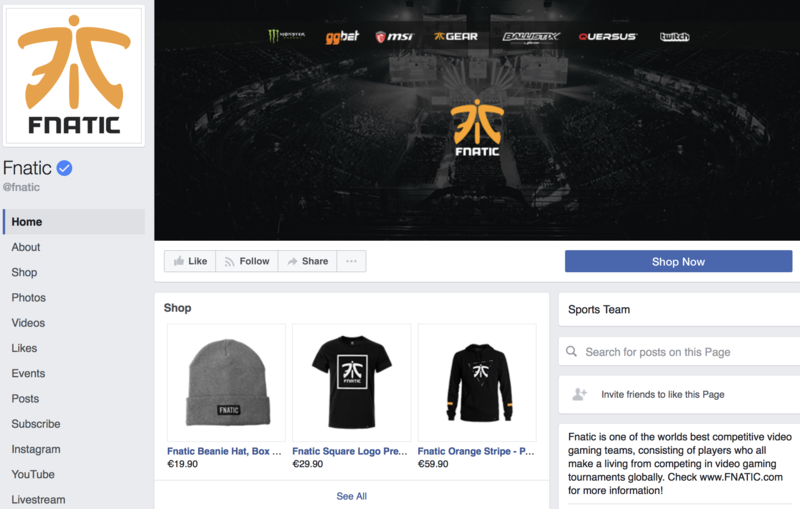 On Facebook, Fnatic is far ahead of the game. With about 2.6 million followers—only counting its main channel—Fnatic outranks runner-up Natus Vincere by about 800,000 fans. Scrolling through Fnatic’s Facebook timeline mainly brings up gameplay highlights, behind-the-scenes material, important announcements, giveaways, merch sales, and, probably most importantly, a comparatively high amount of interaction between the social media team and the fans. To be fair, Fnatic’s amazing numbers are potentially tarnished by a large number of “fans” who hail from parts of the world that run click-farms—groups that offer a certain number likes in exchange for cash. But that’s also true for many other esports orgs on Facebook, and there’s no guarantee that the likes are paid for. Twitter is arguably the most important platform for esports. Breaking news, roster announcements, sponsorship deals, find their way to Twitter first more often than not. It’s also worth mentioning the never-ending debates, rants, insights, and fights between players, pundits, and fans that mainly take place on Twitter. Twitter somehow managed to become the main platform for esports. With team owners sharing interesting insights or announcing changes, with players talking about their personal life and thoughts, and pundits debating the most recent topics—Twitter is the place to be. 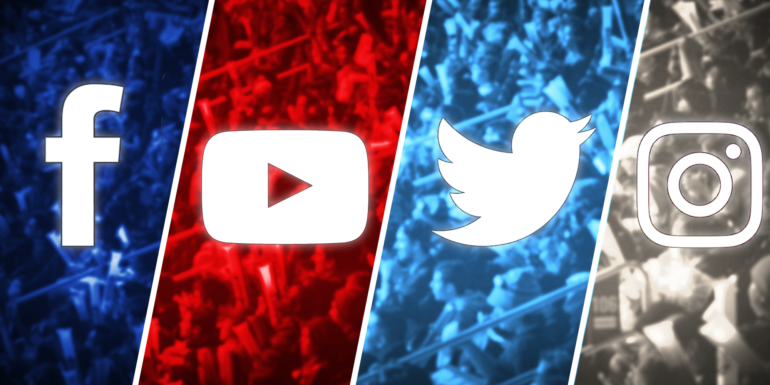 Other than on Facebook, where three Europe-based organizations are on top of the board, esports’ best Twitter performers are based in the U.S.
FaZe’s Twitter channel is stacked with content. Gameplay highlights and stills, pictures, and, of course, FaZe-typical team house walkarounds. Interestingly, OpTic Gaming’s Twitter feed, which fights a head-to-head race over first place with FaZe, feels completely different. Less pictures and videos, and way more Twitter-typical communication like you’d expect from an individual, for example. Instagram, which was bought by Facebook in 2012, is still comparatively small in esports. The platform—known for its selfies, food-, pet-, and holiday-pictures—works better for individuals than whole organizations. But a few orgs still manage to do very well on the platform. 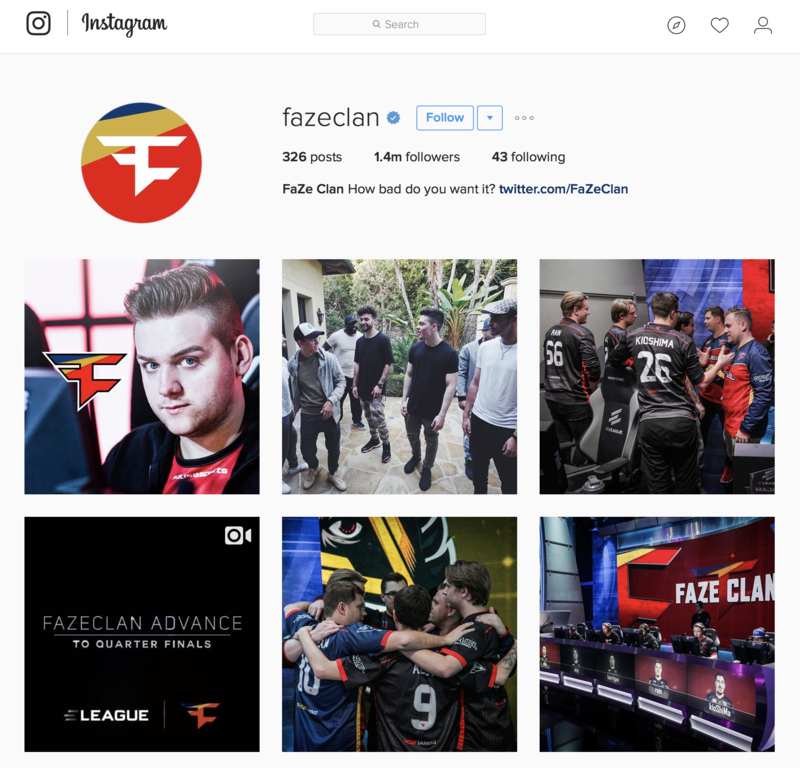 While it’s fair to assume that Instagram works better as a platform for individuals rather than orgs, FaZe Clan has a whopping 1.5 million followers on its channel, and thus, is clearly the outlier. Runner-up Fnatic only gathered around 380,000. FaZe isn’t really doing anything different on Instagram than the rest. Pictures of players, behind the scenes material, advertising merch, etc. 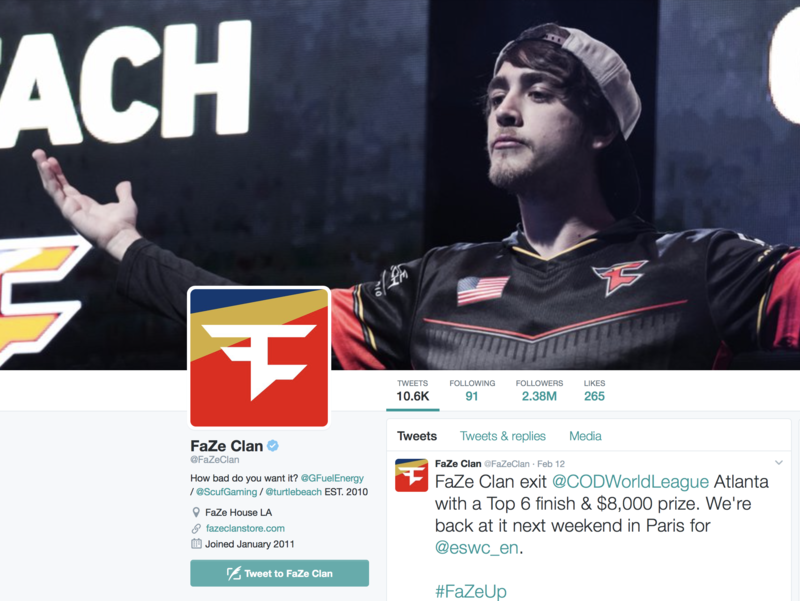 FaZe is ranked number one on Twitter, Instagram, and—coming next—YouTube. While Twitch is still mostly unchallenged when it comes to live broadcasting esports, YouTube is undeniably the place to be for everything recorded. Podcasts, shows, documentaries, highlight videos, you name it. YouTube content is fairly easy to monetize and as such, high up on the list of engagement tools between fans and esports orgs. YouTube is where the race is long decided. Almost 4,400,000 fans subscribed to FaZe Clan’s YouTube channel. Optic and Na’Vi, ranking second and third respectively, are above the one million threshold but don’t even come close to FaZe with both subscriber counts combined. 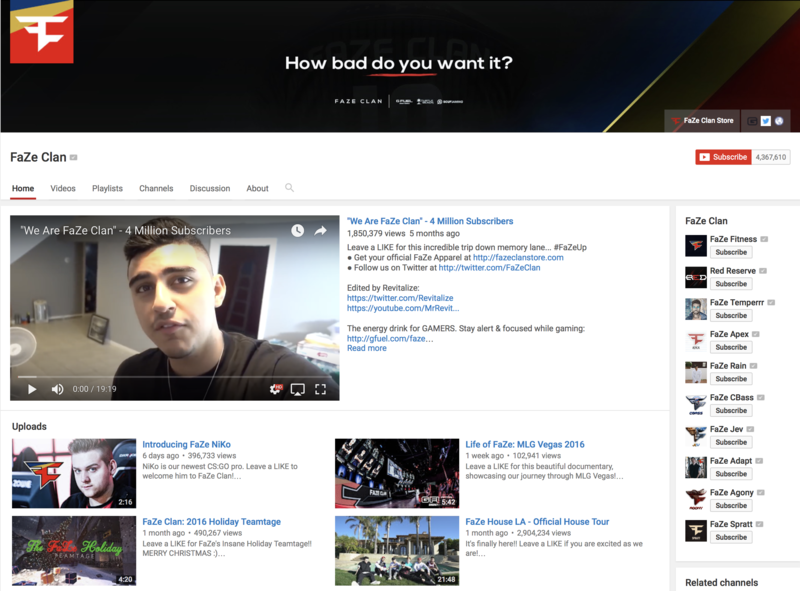 The world’s most-subscribed gaming team, as FaZe states in its YouTube description, produces daily content since 2010 and gained more than 400 million views. It’s safe to say that it’s the backbone of FaZe Clan, its biggest asset. All platforms combined, FaZe Clan (8.65M), Fnatic (4.25M), and OpTic Gaming (3.98M) are esports’ top performers on social media. Advertisers as well as traditional sports brands, which are eager to catch up with esports’ young audience, will surely continue to keep a close eye on the esports scene and its growing social media presence. Data was taken from influencer.gg on Feb. 15, 2017.